The IPO market isn’t looking much more vibrant than last year, underscores a new survey. That could be discouraging for those who hoped a blah year would lead to a booming one. In fact, unless the fall is an especially active time for IPOs — and it might be — 2017 may well serve as one of the less memorable years in recent history. You probably remember some of these stats from 2016: a 65 percent decline in the number of U.S. IPOs from a recent high of 363 in 2014; a 37 percent decline in the number of U.S.-listed companies as companies disappeared, were taken private or simply decided to operate privately longer. The story is much the same so far this year, shows a new report from the law firm Fenwick & West. In the first half of this year, it notes, there were 12 tech and 15 life sciences offerings, or 27 offerings altogether. 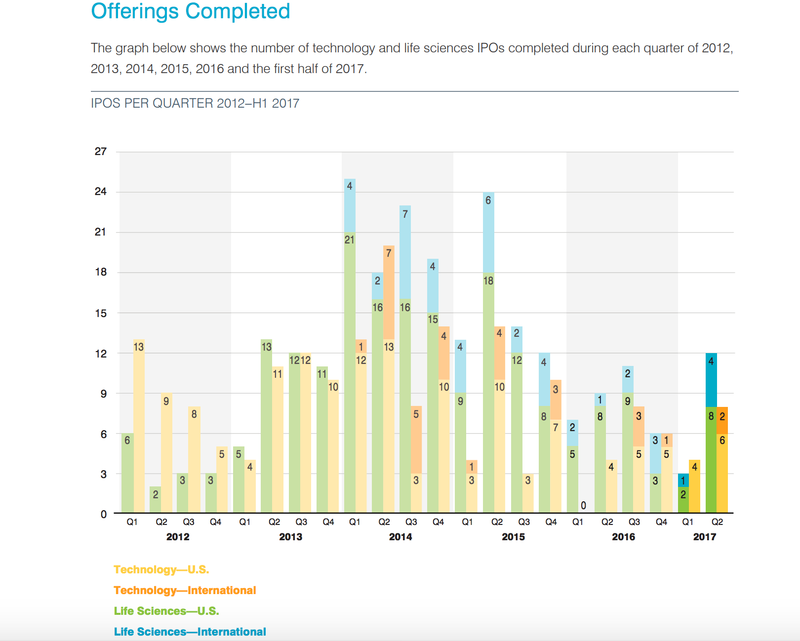 That’s very close to the 31 IPOs that were executed in the second half of last year (14 in tech, another 17 for life sciences companies). If aftermarket momentum reinforces positive investor sentiment toward IPOs, Snap’s widely watched IPO — the largest in the first half of 2017 — doesn’t bode well for other companies that were hoping to get out this year. Though it generated proceeds of $3.4 billion, its share price has mostly moved in a downward line. While its IPO shares shot from $17 to nearly $25 a share on its first day of trading, they’re currently valued at just $13.50 apiece. Other data points of note: As is often the case, tech deals were larger than their life sciences counterparts in the first half of this year, with 75 percent of tech transactions exceeding $100 million, while just 20 percent of the life sciences transactions exceeded $100 million. Meanwhile, life sciences IPOs appeared to experience more predictable pricing, says Fenwick, with 93 percent of the transactions in the first half of the year priced at or above their red herring price range, compared with between 83 percent of the tech IPOs that priced at or above their anticipated range. You can check out the full list of both tech and life sciences companies to go public in the second half, along with numerous other interesting data points that were teased apart by Fenwick, right here.